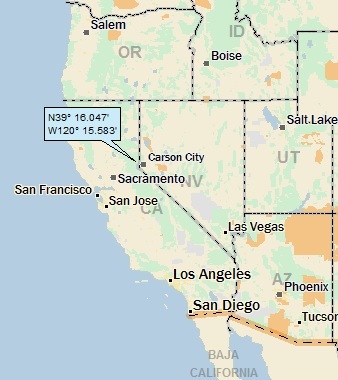 I’ve gone from a landing in the beautiful Absaroka Mountains of Wyoming to the beautiful Sierra Nevada of California. . . I landed in the Truckee River watershed (first hit!). 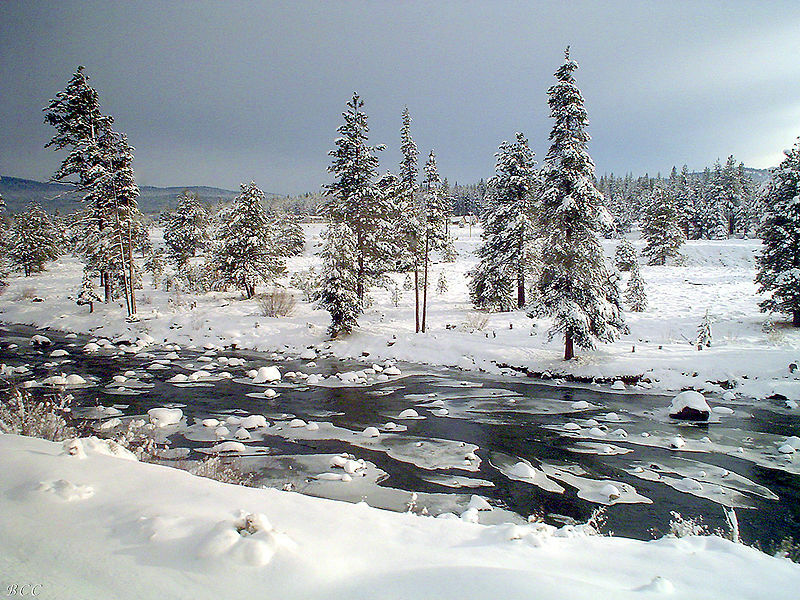 The Truckee is the river that runs out of Lake Tahoe. It flows east into Pyramid Lake (with nothing flowing out), over in NV. 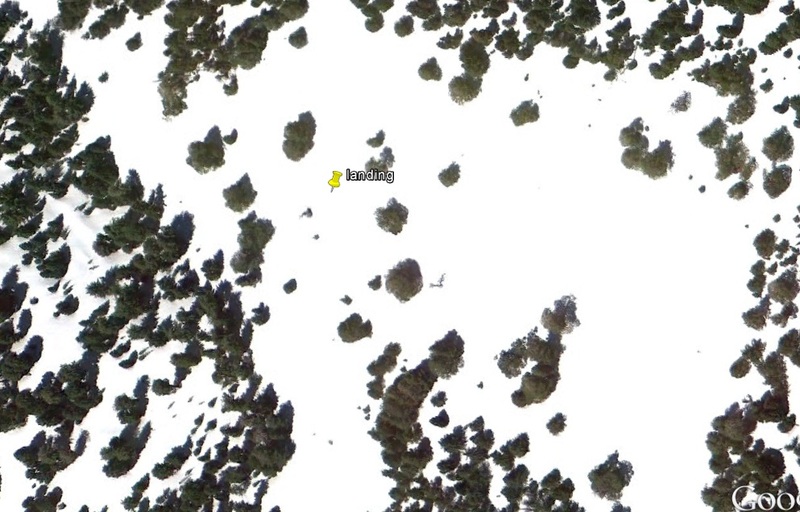 I zoomed closer in; I landed in a snowy alpine (sierra nevadine?) field. For reference, the open field is about two football fields across. That’s the Truckee River flowing out of the Lake. If you follow the valley in the foreground (and extending towards the right side of the photo), that’s the old pioneer California Trail, with Donner Pass at the right edge of the photo. More about Donner Pass later. But first, this about Truckee . . .
During the 1830s and 1840s, increasing numbers of Americans began to traverse the Humboldt desert westward toward what is now called the Truckee River basin. These grateful pioneers named the river after a friendly Paiute Indian chief (Chief Truckee) who safely guided their wagons over the Sierra Pass into California. Note that Chief Truckee was a trusted guide for John C. Fremont, who “discovered” Lake Tahoe. Amazingly, this is the third of the last four posts with a significant reference to John Fremont! 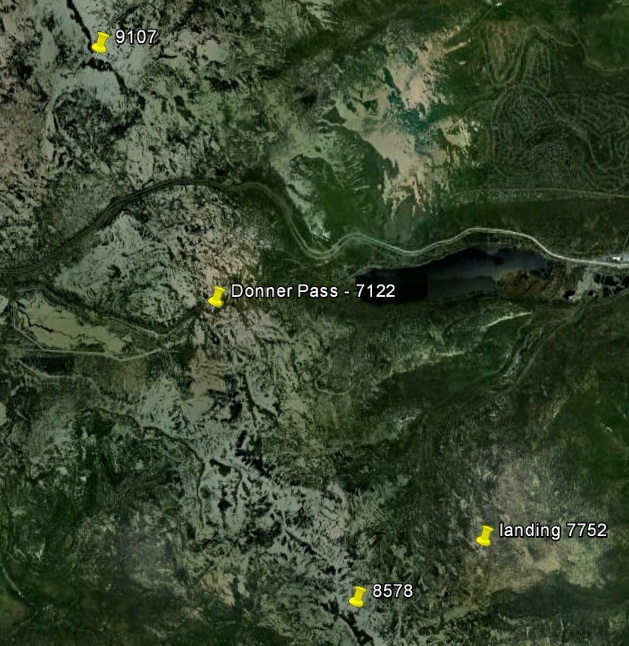 Note that before Donner Pass was named Donner Pass, it was named Fremont Pass. 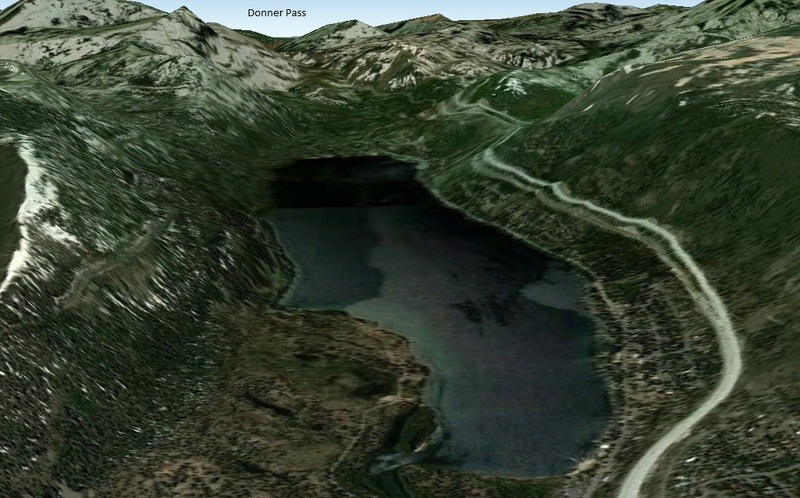 Speaking of Donner Pass, it’s located about 5 miles from my landing. Here’s an oblique GE shot showing Donner Lake in the foreground (which used to be called Truckee Lake, by the way), and Donner Pass in the distance. 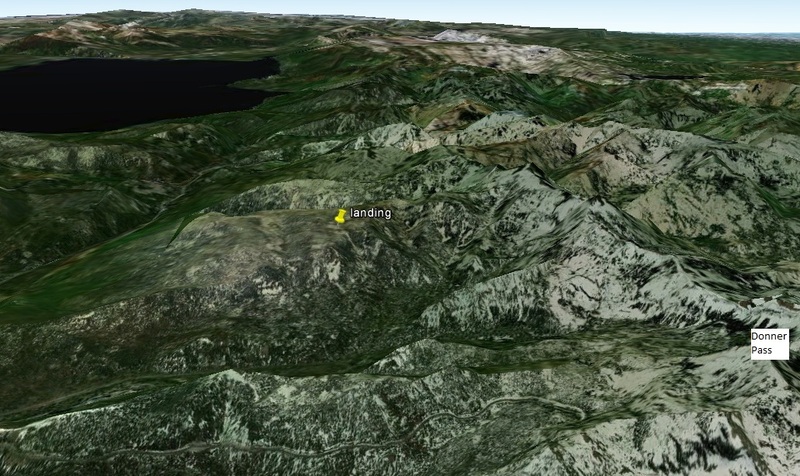 This is the setting for the Donner party drama discussed a little later in the post. My landing (not shown) is off to the left. 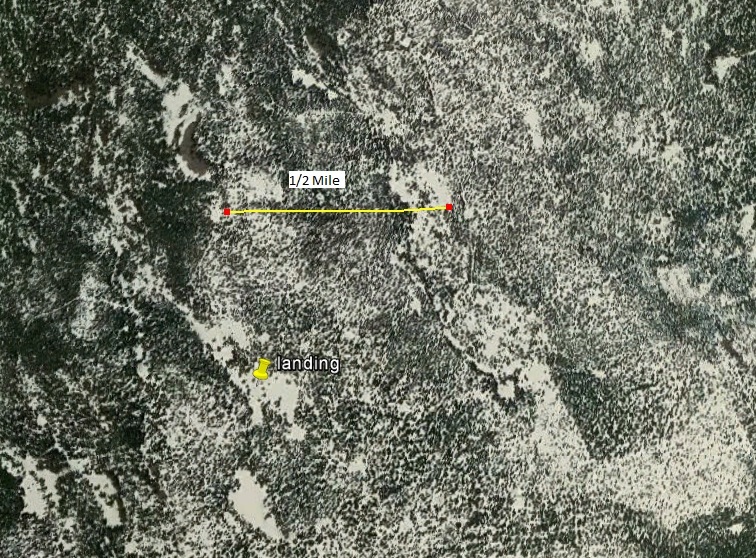 The GE shot below shows my landing (at an elevation of 7752), a nearby mountain top (elevation of 8220), Donner Pass (7122), and a mountain top (9107) on the other side of the Pass. 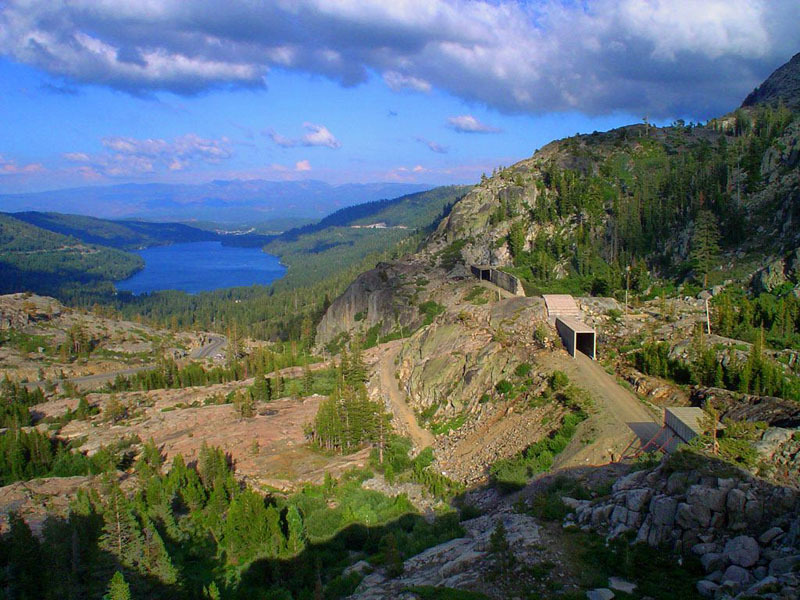 Donner Lake in the distance and the now abandoned railroad grade over Donner Pass. The Lincoln Highway can be seen in the middle of the photo, climbing the pass, on the left side of the photo. To reach California from the East, pioneer emigrants had to get their wagons over the Sierra. In 1844, the Stephens Party followed the Truckee River up into the mountains. At the head of what is now called Donner Lake, they found a low notch in the mountains and became the first overland emigrants to use the pass. The pass received its name, however, from another group of California-bound emigrants. 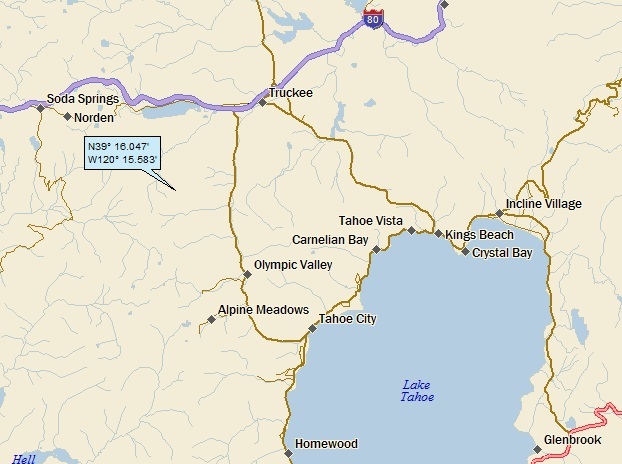 In early November 1846, the Donner Party found the route blocked by snow and was forced to spend the winter on the eastern side of the mountains, in cabins near Donner Lake. Of the 81 emigrants, only 45 survived to reach California; some of them resorted to cannibalism to survive. Both a source of settler pride and an example of hubris, the Donner Party ordeal is Truckee’s most famous historical event. In 1846, a group of settlers from Illinois, originally known as the Donner-Reed Party but now usually referred to as the Donner Party, became snowbound in early fall as a result of several trail mishaps, poor decision-making, and an early onset of winter that year. Choosing multiple times to take shortcuts to save distance compared to the traditional Oregon Trail, coupled with infighting, a disastrous crossing of the Utah salt flats, and the attempt to use the pass near the Truckee River (now Donner Pass) all caused delays in their journey. Finally, a massive, early blizzard brought the remaining settlers to a halt at the edge of what is now Donner Lake – about 1,200 feet below the steep granite summit of the Sierra Nevada mountains and 90 miles east of their final destination, Sutter’s Fort near Sacramento. Several attempts at carting their few remaining wagons, oxen, and supplies – sometimes by pulling them up by rope – over the summit proved impossible due to freezing conditions and a lack of any pre-existing trail. The party returned to their camp near Donner Lake, broken in spirit and short on supplies. What followed during the course of the brutal winter is a miserable story of starvation, including cannibalism. The survivors were saved by a Reed Party member who had been ejected from the party months earlier (and taken a different trail to Sacramento). Seeing that the Donner Party never arrived at Sutter’s Fort, he initiated several relief parties. Of the original 87 settlers, 48 remarkably survived the ordeal. Winter weather at Donner Pass can be brutal. At an average of over 34 feet of snow per year, Donner Pass is one of the snowiest places in the United States. Four times since 1880 total snowfall at Donner Summit has exceeded 60 feet and topped 65 feet in both 1938 and 1953.